Ball tip steak is easier on your wallet and figure than other types of steak but may lack the tenderness of a better quality cut of steak. Ball tip steak is also known as sirloin tip steak but should not be confused with top sirloin steak, which is much more tender. Ball tip is cut from the top of the hip bone. It's very lean and tastes better when tenderized with a marinade overnight. Marinate a ball tip steak overnight to tenderize the meat. You can use a premade marinade or combine equal parts vinegar, oil and Worcestershire sauce to create a simple marinade. Place the steak and marinade in a resealable plastic freezer bag. There should be enough liquid to fully cover the steak. Refrigerate overnight. 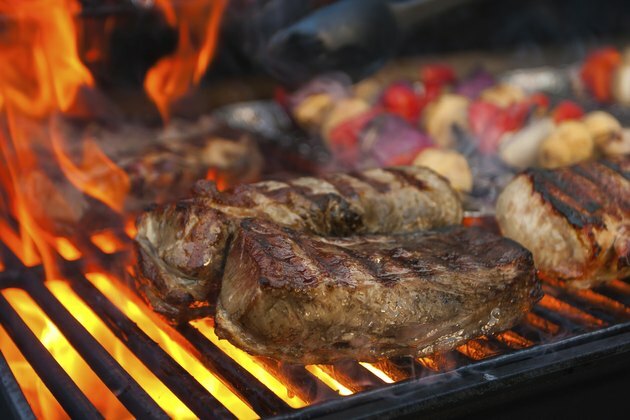 Remove the steak from the refrigerator one hour before cooking to allow the meat to return to room temperature. Heat a heavy skillet over medium heat for four minutes. Remove the steak from the freezer bag and blot dry with a paper towel. Fry the steak in the pan with a lid on top. Turn the steak only once so it has time to develop a caramelized brown coating. Fry the steak according to your preferences. For a 1-inch steak cooked rare, fry on each side for four minutes. A medium-rare steak is ready in five minutes; a medium steak is ready at the six-minute mark. Remove the steak from the pan and wrap in tin foil. Allow the steak to rest for five minutes to further develop its flavor. Overcooking your steak may cause it to become tough.